It’s a proud moment for Dubai VISA.com! With more than 2,00,000 Visa applications across the globe, we have attained a new landmark in the field of visa services. Applicants seeking a Dubai/UAE visa can apply here and be a part of our excellent visa services. Why The Dubai Visa ? Please Note: Once the visa will be approed, you will receive soft copy of e-visa via email. You need to take the print of the e-visa copy. 14 Days Visa: This is recommended for visitors planning for a short stay in Dubai or UAE for Trips, Meetings, Conferences or Transit stay etc. 30 Days Visa: If you want to take a short trip to UAE to catch up with your family or friends, then this visa valid for 30 days will be the ideal option for you. 60 Days Visa (Single Entry): This is recommended for visitors planning for a long term stay in UAE to visit their family or friends. This is a Single Entry Visa and once the visitor exits UAE (within a span of 60 days), the visa expires. 90 Days Visa (Single Entry): This is recommended for visitors planning for a long term stay in UAE to visit their family or friends. 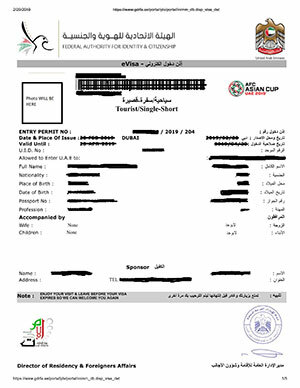 This is a Single Entry Visa and once the visitor exits UAE (within a span of 90 days), the visa expires. 90 Days Visa (Multiple Entry): This is recommended for visitors planning for a long term stay in Dubai or UAE for multiple times like Meetings, Conferences or Transit stay etc. A trustworthy name in the field of UAE visa service providers. I went to Dubai to meet my daughter and returned to India couple of days back. Before flying to Dubai, I was not sure whether I will get my visa processed on time or not. It was really a fuss for me thinking of long queue, expensive processing and all other formalities. But big thanks to Dubai VISA.com and all the supportive staffs for processing my UAE visa application with no hassle. It was indeed an excellent service! Now, what all I can say that travelling abroad is not that wearisome if an excellent service providers like Dubai VISA.com is there. Guys, if anyone looking for an effortless visa processing in affordable charges along with pleasing assistance, go for Dubai VISA.com. Kudos to the kind of support services they render! Being an independent travel blogger and a social worker, I keep on exploring new places both locally and globally. I personally thank to all supportive associates of the organization who helped in getting my UAE visa with minimal effort. From my personal experience, I would recommend this site to everyone. Their service standard is simply unparalleled and also very reliable!